I went back and forth for a while between three stars and four for Dear John. Certainly not meant to be high literature, it is engaging and fun. I found the character development solid and the protagonist's journey believable - two important factors for this kind of summer beach read. Plus, a romantic novel from the man's point of view (written by a man) is refreshing. I've seen claims that Sparks' books seemed "cookie cutter" so I hadn't picked any up since A Walk to Remember, but this one was pretty good. 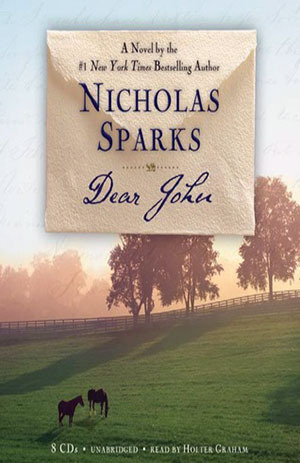 Sign into Goodreads to see if any of your friends have read Dear John.